觀點洞察 - Has China-A fully priced in the MSCI inclusion? Not yet. Since China-A market began its rally this year, we started getting more enquires and interest for our two China-A strategies, Bedrock Economy (2803.HK) and New Economy (3173.HK), from clients in different regions. Some of them are worried that they might have missed the opportunity and the market is now fully pricing in the MSCI inclusion. The common phrase “Buy on rumor, sell on fact” suggests that it might be too late to participate in the market at this point. We don’t agree with that point of view and would like to clarify 5 key but flawed assumptions in the market. 1. China A dropped after inclusion last year. Why would this year be different? Yes, the index inclusion was initiated in May last year, but the inclusion factor was a mere 5%, meaning that China-A’s weighting only accounted for 0.8% in the MSCI Emerging Market Index. The implication is that a lot of global asset allocators might simply ignore it without even expending effort to studying China-A investability. Why bother with a trivial position when considering all the inconvenience in building up the research, setting up the operations, and in particular catching a falling knife when the market continued to trend down throughout last year? It is unlikely that fund managers would need to consult with their risk or compliance managers for such a tiny mismatch or tracking error in their portfolios. The latest inclusion arrangement, however, is fundamentally different in the sense that fund managers can no longer avoid China-A without doing proper work. Based on the current plan, the weighting of China-A will become 3.3% in the MSCI Emerging Market Index by the end of this year. No matter whether the investors like it or not, they must review China-A at such a weighting. One may still come up with an investment decision not to own any exposure after a thoughtful process, but it is a fiduciary duty to conduct a thorough study of the China-A market before reaching conclusions. Recently, I had a chat with a buy-side strategist, who has been pounding the table in recommending China-A to his investment team since the fourth quarter last year, but no one paid attention until one of the portfolio managers eventually listened and found that there was no instrument approved internally yet. It highlights that a lot of investors simply stayed away in the past and are now unprepared for implementation. At 3.3% of MSCI EM, we are now seeing a fundamental change among investors’ mindset in reviewing the China-A market this time around. 2. The market is already up after MSCI’s announcement in February. Is there more upside? Quite a lot of investors seem to forget that the inclusion factor by the end of this year is 20% only, meaning that there is still 80% left for full inclusion in coming years. What a blind spot that people only focus about the increment from 5% to 20% this year but totally lose sight of a much larger portion waiting to be included. Taking the cases of Korea and Taiwan markets as examples, they both went through a lengthy process in the 1990s to have their markets fully incorporated into the MSCI Emerging Markets Index. Instead of thinking about China-A index inclusion as a non-event, we must acknowledge that we are only at the starting point for China-A to be explored and embraced by global investors. Steady inflows will continue into Shanghai and Shenzhen stock markets for the next few years. In terms of performance, some investors may wonder if China-A is overshooting after the strong run so far in Q1 this year. It does indeed look like the rally may be too steep and too fast, outperforming all major markets globally year-to-date. The picture looks very different, however, if you extend the timeline to 1, 2 or 3 years. Even after the last 3 months, China-A is ~10% behind MSCI AC World Index. China-A is just playing catch-up to global markets – onshore investors did not participate in the global equities rally over the past few years as the return of China-A was disappointing. On the valuation front, the story is even clearer. China-A is trading at a decent discount to its historical average. 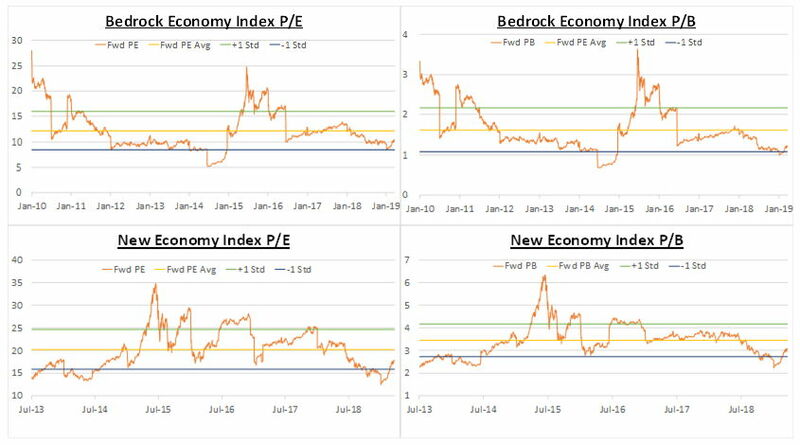 If looking at the underlying benchmark indexes of our two China-A ETFs, Bedrock Economy and New Economy, they are trading at a range of 0.5-0.7x standard deviation below their historical average P/E and P/B. There is plenty of upside if China-A simply manages to return to its average position. 3. Many stocks are dual-listed in HK. Can foreigners access MSCI’s inclusion through dual-listed offshore stocks instead? There are currently 111 dual-listed companies, trading as A-shares in Shanghai/Shenzhen and as H-shares in Hong Kong. For example, investors can gain exposure to mega-caps like ICBC, Bank of China, and PetroChina through their H-shares or A-shares. This is what the AH Premium typically measures. Yet the 111 dual-listed companies are only a limited selection of the total 3,668 listed companies in China-A. There are many different companies or unique sectors that are available only in the onshore market. Even if we focus on the narrow universe of the current MSCI China-A Inclusion, the dual-listed shares account for only 25% in terms of number of companies, or 35% in terms of index weighting. In addition, the latest round of inclusion will add mid-caps and ChiNext shares into the index this year. The dual-listed shares, therefore, will account for an even smaller percentage – we estimate only 16% in terms of number of companies, or 30% in terms of index weighting. 4. Foreigners are too small a part of China-A. Does inclusion even matter? Every media or research house always quotes that foreign ownership of China-A stands at ~2%, lagging major Asian markets such as Taiwan’s 26%, Japan’s 30% and Korea’s 34%. The low single digit number seems to indicate that foreign investors do not have any control in driving the stock market. It is true that domestic investors remain the core shareholders, particularly for SOEs, whilst local individuals are the majority of daily trading turnover. If we dig into the numbers deeper, however, we find that foreign investors are increasingly influential in China-A. First, after adjusting market-cap for free-float, which is a better yardstick for considering the impact on prices, we find that foreign ownership is getting close to ~8%. At almost 10% today, foreigners are still a small part of the China-A market but are no longer a negligible amount. Second, despite the low estimates for foreign inflows by various strategists (USD 70-100 billion vs average daily turnover of USD 80 billion year-to-date), foreigners are already contributing materially to turnover. 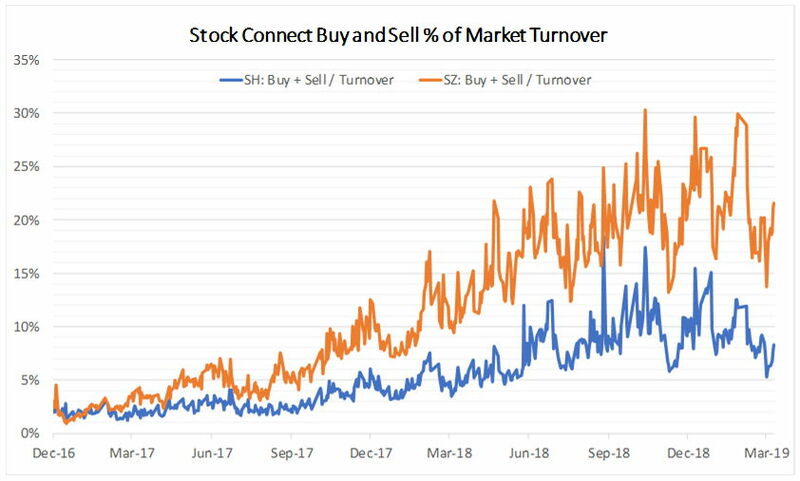 Stock Connect, running smoothly over the past 4 years, is getting more meaningful in the daily turnover of Shanghai and Shenzhen Stock Exchanges. Buy and sell amounts together are accounting for ~22% of Shenzhen’s turnover and ~8% of Shanghai’s, rising from just ~3% two years ago. 5. China has too many structural problems – quotas, suspensions, few investment tools. Is the rally sustainable? Pay close attention to recent market developments and you’ll find that many of the structural issues are moving toward resolution. For market access, foreign investors can now invest in China-A through multiple channels including QFII, Renminbi QFII, and Stock Connect. 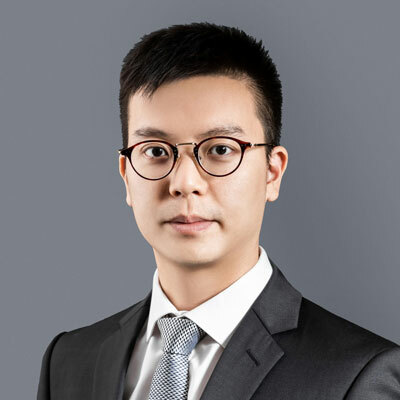 In addition to the expanding quota granted by the State Administration of Foreign Exchange in recent years, Chinese regulators are drafting rules to combine the two inbound investment schemes, QFII and Renminbi QFII, while broadening their investment scope to include derivatives, over-the-counter equities or New Third Board, bond repurchases and private funds. The new rules are aimed at promoting high-quality opening of China’s capital markets and introducing more long-term overseas capital. Another area that leads to hesitation from international investors is the ability of onshore companies to suspend trading of their shares, preventing investors from selling their holdings. 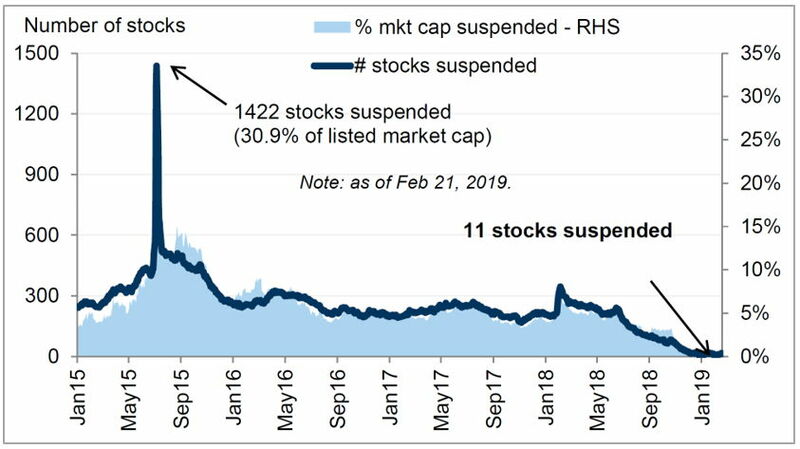 The practice reached a peak during the stock market crash in mid-2015 with more than 1,400 companies, nearly half the A-shares market, suspending their shares. To tackle this issue, the regulator issued new guideline in late 2018, governing stock trading suspension and resumption. The number of suspensions dropped dramatically – today only 11 stocks, or 0.3% of the total, are suspended. Lastly, it should be noted that the Chinese authorities are increasingly adopting a market approach in fine-tuning policy, even during periods of strong headwinds throughout 2018. The “national team” did not appear to support the stock market during the set-back last year, showing the government’s determination in decreasing intervention and its willingness to let market forces play a greater role. 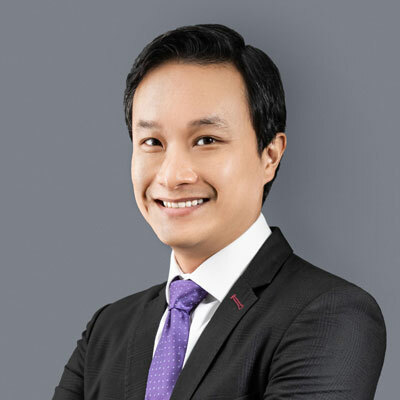 Having said that, there are of course further improvements to be made, such as foreign ownership limits on individual stocks, allowing short-selling, and establishing a registration-based initial public offering mechanism, etc. Instead of condemning the market alongside critics or academics striving for perfection (and not putting their money where their mouth is), we believe investors should instead take advantage of any consolidation in the near-term to accumulate China-A exposure. With low valuations, continued opening up and ongoing regulatory reform of China-A, we believe that the index inclusion will have a long-lasting positive effect and the market has not yet priced it in.